Trolling has been good with some good browns and rainbows trolling around the deeper waters have been the pick for most boats with some really good browns taking the spotted dog Rapala lures. Tassie Devils have been working well close to the shore line this is where you will find the rainbows. There has not been any best areas on the lake it’s been fishing well all over the place in deep and shallow waters. Fishing early morning has been the best but with all this bad weather the fishing has been good all day and if the wind comes up try trolling into the wind with Tassies results have been good!! Howdy Michael, Peter at Braemar with a fishing report for the week ending August 21st 2016. Well once again the weather was all over the place with fine sunny conditions before 2 brutal fronts moved in late week bringing snow and strong winds once again. 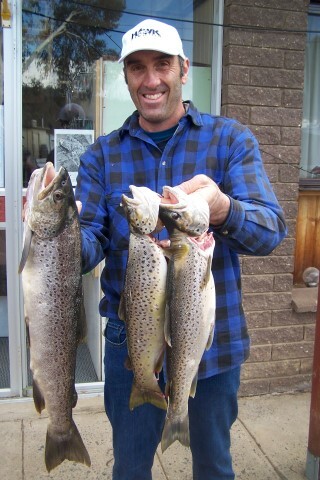 Despite all the inclement conditions the fishing actually improved, the rough days being best with several decent Browns to 2.6kg being caught, the best results were had by Michael Ball from Sydney who made a flying visit to Braemar after spending time at Jindabyne for no result, Michael managed a magnificent Brown at 2593 gms and 2 others at 1407 gms and 1104 gms spinning off the bank in front of the Park. The Fildes group from Victoria had a mixed few days fishing wise, they encountered quite a few small Rainbows that were readily taking bait, worms and powerbait, but generally results did not come their way, Oleg and Yuri braved the conditions for a few small Rainbows as well using the same bait combination, but the Ballard gang from Yass made several sorties into the night and managed a magnificent kilo Brown very late which was also caught on worms. I managed to get out for 2 hours during the week and have to say that the Lake is looking good, the traditional bays and lay of the land is returning to something more familiar now and the fish are on the move searching amongst the trees and rock pools looking for food, I used a variety of Pegron lures and whilst I never caught any fish I had dozens of chases and the occasional nip at the lure, the fish are there but still a bit shy, it all suggests that the next few weeks will bring about some great bank fishing. The trolling scene was a little slow as you can imagine with the strong winds preventing people from launching out, but Arthur and Dennis Simmons from Melbourne caught 14 fish trolling near Heron Island on one of the few calm days we had last week, best Tassie’s were # 106 #37 # 55 # 10 and number 50, none of these lures are similar in colour so it suggests the fish were readily taking what was near them, Arthur and Dennis released all of their catch which was a combination of Browns and Rainbows up to about 800 gms. Pictured below is Michael Ball with his catch from Braemar in a 1 hour outing. Trolling is picking up at the lake with good results coming from waste point, Kalkite, East Jindy, Dam will and down passed the bowling club most trolling has been out around 30 meters from the shore line. Much the same as eucumbene trolling with Spotted dogs and tassies have been the pick early mornings and from 2pm till dark if you can handle the cold. From now on you should start seeing better results on the troll now the brown are back down from the spawn run. Most places around eucumbene are fishing well with worms and chunky cheese power bait we are starting to get more reports on rainbows and in great condition. Best areas are Seven gates, frying pan, Rushes, Anglers Reach and some really good reports from Braemer Bay.